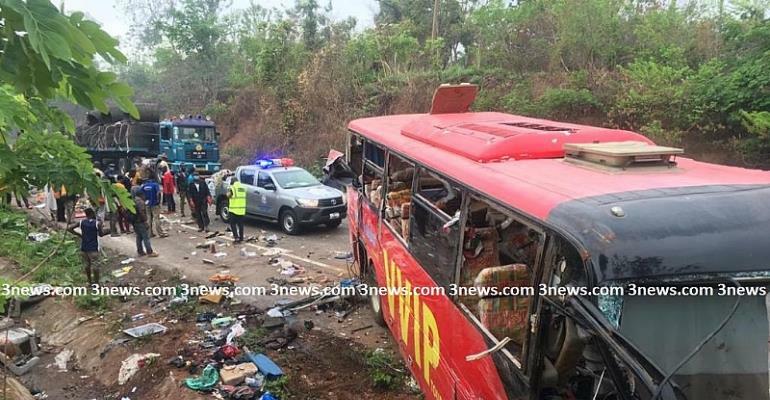 Over 50 people are feared dead in a fatal accident involving two buses on the Jema-Techiman road on the Tamale highway in the Bono East region after a VVIP bus crashed with a Tata bus. According to Otec News’ Waudu Ishaku reporting from the scene said the accident happened when the buses with registration number GT 3915- 17 VVIP Akai bus loaded from Garu heading towards Kumasi collided with a Grand Bird bus with registration number GT 5694-18 loaded from Accra and heading towards Bolgatanga. The Tata bus has burnt into ashes, including some passengers and some others could not be identified as a result of the shredded bodies. Reports so far gathered indicate that the driver of the VVIP bus driver who is burnt to ashes was dozing but some of the passengers who hot sensed of danger alerted him to park off and rest for a while but he declined, leading to the crash. The police and Fire Service personnel are at the scene to control traffic.